Friday's disaster drill starts with a fictional tsunami off the coast of California. (CNN) -- If your Facebook page or Twitter feed lights up with news of a tsunami off the California coast, don't get too worried. At noon ET Friday, a drill was launched by natural disaster experts at San Diego State University to test how social media would be used to respond to a crisis. Exercise 24 (X24) is being run by the university's Immersive Visualization Center. Participants from 15 countries, including the United States, organizations such as the United Nations and Red Cross, and other business, nonprofits and individuals will be involved. The idea is to test the speed and widen the scope of responses to a major disaster, focusing on how social media sites like Facebook and Twitter can be used. "Ultimately, the goal is to get there faster, respond more effectively to save lives, communities, businesses, etc.," read a written release on the drill. Organizers said that all messages about the fictional disaster would be marked clearly as fake on the Web. 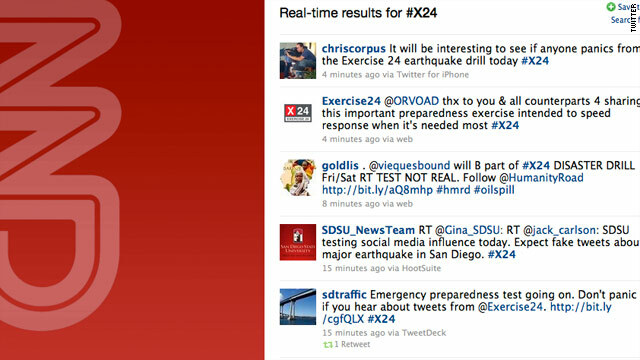 "#X24 IS A TEST, NOT REAL [link] CNN.com Earthquake strikes coast of Southern and Baja California http://bit.ly/Exer24 1 ...," was the first mention. Instead of a CNN story, the link went to a Web page explaining the drill and how users can participate. As time went on, details included reports of snapped bridges, severe flooding and a tsunami on the way. "#X24 IS A TEST, NOT REAL TV said large wave headed toward coastline! Everyone get out! http://bit.ly/Exer24 3-9 ...," read a later post. Social media has become an increasingly important tool in disaster response in recent months, particularly during the Haiti earthquake and Gulf oil disaster. During the recent wildfires in California, responders used sites such as Facebook and Twitter to track the fires and see what people were saying about them. Friday's fictional scenario starts with a major earthquake off the coast of Huntington Beach, California, generating a tidal wave and an oil spill. A social media aggregator program will be used to try to bring together all the information about it on social media sites. On Friday, about 50 members of government and relief groups huddled in the drill's dimly lit, makeshift command center at San Diego State University. Chris Mayfield, a civilian systems engineer with the U.S. Navy, tapped on his keyboard. "We have to be ready in case something like this gets to the presidential [federal] disaster level," said Mayfield, who is with the Space and Naval Warfare Systems Command. SPAWAR helps deploy critical federal response teams and equipment during disasters. "For example, somebody needs fresh water," Mayfield said. "So we need to find out, how do we get it? Are there troops available who can bring that to them? What's the time line?" At the center, U.S. and Mexican flags hung on the wall, symbols of the need for both countries to cooperate on logistics if such a massive earthquake hit the area. While government and relief organizations are the official participants, the public is being asked to help, too. People were asked to visit the InRelief.org website starting at noon ET to see if the site can handle a huge amount of traffic. They are also being asked to find and follow specifically branded sites on Facebook and Twitter, to help see how easy it will be for people to get information that way. "Essentially we're challenging the public to teach response groups what they need and want re: social media engagement in a very real sense and then to put it all to work," said a written release. "We'll develop and share the results in a report with everyone afterwards." As of about 5 p.m. ET on Friday, the InRelief site was performing well, said Google spokesman Dan Martin. The site is built using Google Apps. Martin said that, at that time, the site had seen 10,000 unique users from 60 different countries. The drill will last through Saturday. CNN's Paul Vercammen in San Diego contributed to this report.